Ross Handling's industrial vintage castors are great for adding character to your furniture and displays to give them an antique feel. These vintage wheels and retro metal castors have an antique look vintage cast iron spoked wheel top plate castors are available in 3 sizes 100mm, 125mm and 150mm. 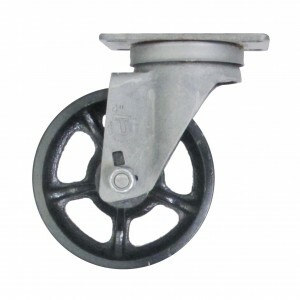 The vintage castors can be supplied in swivel or swivel with wheel brake and fixed. With high load capacities these vintage castors have substance to match their robust look and feel. Choose either cast iron spoke option or for a softer tread ( where floor surface is softer and you don't want to damage the floor ) choose the Polyurethane soft tread option! Choose either a top plate fitting to attach to the underside of your equipment, or for tubular attachment or screwing into wooden furniture choose the threaded stem option of our Retro Casters range.